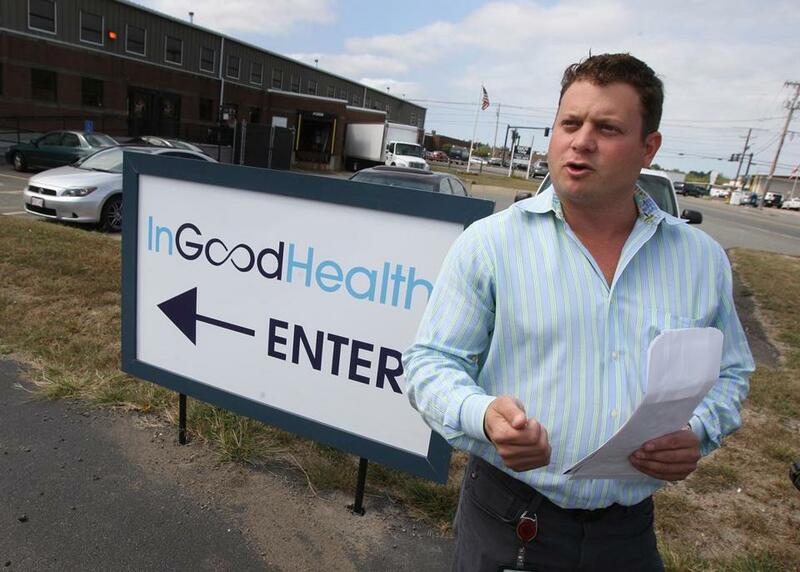 David Noble, president of the In Good Health medical marijuana dispensary, at the Brockton dispensary on its opening day, Sept. 4. One medical marijuana dispensary keeps running out of cannabis, forcing clients to drive hours to find another open shop. Another has battled mold in its crop. And patients seeking to shop at one of the state’s four dispensaries report difficulties with the state’s online registration system. More than three years after Massachusetts voters approved marijuana for medical use, dispensary owners and patients continue to confront challenges in the state’s nascent industry. Yet patient demand has been steadily growing, according to the latest data from the Massachusetts Department of Public Health, which regulates medical marijuana. More than 2,600 patients registered for the program in December. 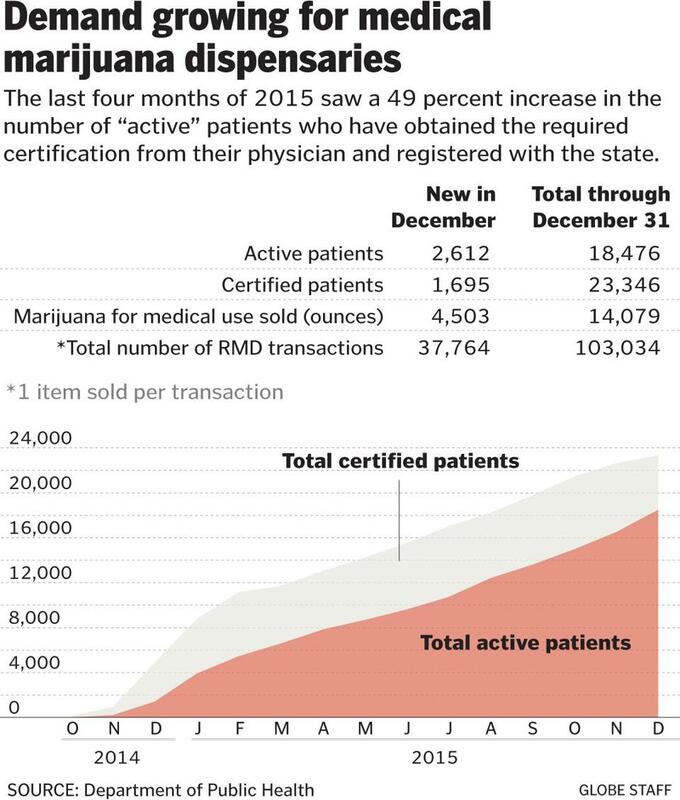 The department counts 18,476 patients who have obtained the required certification from their physician and registered with the state — an increase of nearly 50 percent since late August. In Good Health, the second dispensary to open, has faced a shortage of product — what its president says are issues affecting crop yield. But at the same time, the Brockton dispensary is experiencing a surge of patients, with demand running seven times what David Noble expected when he opened the dispensary in early September. Patients say that as a result, they sometimes wait days or weeks to buy marijuana buds in the Brockton dispensary — if they’re able to get them at all — and their phone calls to the dispensary often go unanswered. He declined to elaborate on the changes being made. In a three-day stretch last week, In Good Health reported serving 371 patients, including 68 new clients. The company has served 3,453 patients since opening in September, Noble said. Since then, two more dispensaries have come online — New England Treatment Access, in the Central Massachusetts town of Northampton, and Central Ave Compassionate Care, in the Merrimack Valley community of Ayer. They join Alternative Therapies Group in Salem, which opened last June, the first dispensary in the state. But patients say four dispensaries are not nearly enough, given the distance between them and ongoing supply problems. At Compassionate Care, the kitchen is still under construction. That means the company has been unable to produce marijuana-infused products, such as the baked goods and lozenges preferred by patients with respiratory or immune system problems that make inhaling or smoking marijuana undesirable. Owner John Hillier said he expects to be selling more products in the early spring when the kitchen is complete. Christopher Edwards, the executive director of Alternative Therapies in Salem, said he, too, expects to have kitchen facilities completed in coming weeks and will be able to offer a wider array of products. “Patients are not getting all of their allotted supply at one dispensary because they either don’t have enough or there is a restriction on selling the full amount,” said Nichole Snow, executive director of the Massachusetts Patient Advocacy Alliance. Alternative Therapies suffered a setback because of a mold infestation in late fall. Workers had to scrap coveted flowering plant tops, also known as the buds, from an entire crop of marijuana grown. But the dispensary was able to extract the oil in a process that kills the mold, leaving the oil safe to sell. Moldy plants can not be sold, said Edwards, the dispensary’s executive director. The shortage of available medical marijuana has posed problems for patients who say they rely on it. Douglas, a 67-year-old Cape Cod resident, said he has driven twice to the Northampton dispensary — three hours one away — because the facility much closer to him in Brockton is constantly out and seldom answers the phone. Douglas, who said he uses marijuana to ease depression, asked that his last name not be used because he fears stigma. Snow said other patients continue to have problems with the state’s online registration system because it requires technical savvy. Patients must register with the state to be allowed to shop in a dispensary. Applicants must be able to scan documents, such as a car registration or utility bill, into an electronic format and upload it into the state’s system. “For someone who does not know how to use a scanner, [it] can be a hurdle,” said Jeremiah MacKinnon, a 20-year-old Methuen patient who said he has helped others with the registration process. State health department spokesman Scott Zoback said his agency is aware of patients’ concerns about the online registration system and is working to make the process smoother. Since June, when the first dispensary opened, the state has been granting waivers to companies, allowing them to sell marijuana that has not been fully tested for pesticides and other contaminants. That’s because laboratory owners in Massachusetts say it takes months to fine-tune their equipment to match evolving state rules for testing the products. In the meantime, dispensaries have been limited to selling a maximum of 4.23 ounces of marijuana to patients for use over two months. Normally, patients would be allowed to buy up to 10 ounces of marijuana every two months. The waivers are expected to be lifted in the coming weeks, and full 10-ounce sales will be allowed, when the state releases new testing rules and laboratories will be up to speed, Zoback said.